Most B2C app businesses today pick up growth tools based on assumptions or by shamelessly copying the strategy of their competitors. Excuse my brevity, but there’s much truth in the statement that I just made. Mobile based referral marketing or In-app referrals have been bitten by this approach numerous times. As a company that facilitates growth for mobile apps via a toolkit, we’ve often come across scenarios where business managers approach us with a mindset that reeks quick growth, lack of awareness or is driven by a strategy that mimics their competition. However business unfriendly it may sound, we’ve often dissed this mindset. Referral Marketing isn’t a ‘one program one solution’ tactic. In fact it behaves differently for each app type. What UBER has achieved with referrals may not be something that Airbnb could achieve and likewise. A seasoned Business Manager needs to approach it independently and explore its benefits layer by layer. In this article, I will be exploring a few avenues that will help you determine referrals as a Marketing fit for your app’s growth. If you are someone who is starting to get warmed up to the idea of mobile based app referrals, this article is for you. Mobile based referrals are a valid growth hack and are often used to boost user acquisition and engagement. However, it requires a systematic approach. Business Managers need to gauge umpteen parameters before taking the final dive, and that’s why the right awareness around the subject matters a lot. Let’s explore the possibilities that need to be considered before entrusting a solution provider with your mobile app referrals. With so much information available around referrals tools, it can be difficult to pick the one that suits your need the best. However, even before zeroing on the tool, it is important to articulate its need and the gaps it may fill for your mobile app growth. When Business Managers run their campaigns, there’s a core goal associated with it. For example, offline marketing can help them build awareness around an app, whereas In-app campaigns are expected to boost engagement. Where do you think mobile referral campaigns fall in your growth strategy, and what goals can you achieve with it? Given the virality associated with mobile referral campaigns, many say that it works like a charm in acquiring and nurturing users. Is that a goal for you too? What is your audience size, does your product offer strong customer benefits and support to catapult referrals? Asking difficult questions before writing that cheque, can help you take a conscious call and avoid any disappointments later. When it comes to mobile referrals, most Business Managers think they know it all. Given the straightforward approach that referrals offer, I don’t blame them at all. Having worked with numerous customers and having evaluated their expectations and pain points up close, we are of a belief that understanding the referral system and idiosyncrasies should be the primary goal and should be done minus pre-conceived notions. While referrals work for SaaS, HR, Consumer goods and other relevant industries, mobile as a platform behaves in its unique manner. Evaluating the need for referral and segregating the user type is just the start. What’s more significant is to understand the core offering of your mobile referral program. Ease of integration is one thing, but does it offer all the essential features? Not all users are equal. While there are ones that contribute regularly to an app’s ROI, there are others that are mere visitors. Most Business Managers are expected to maintain a repository of the valuable vs. not so valuable users for their app. It is significant to define the audience type before kickstarting the mobile referral campaigns. Approach 1: Introduce referrals to dormant/churned users and re-engage them afresh. Approach 2: Introduce referrals to only loyal customers and seek feedback on improvement. As a Business Manager, defining the audience type and strategy will depend on your past experiences with other campaigns, cohorts, and analysis. Introducing referrals to paying users– most users who pay for a product already see value in it and hence will not shy from referring them to their friends and family. Therefore introducing referrals to such customers makes a lot of sense. Identifying regular users– a few users may interact with your app more than others. These users, therefore, make the ideal candidates for testing referrals. You’ve identified the need for referrals, understood its intricacies and also defined the audience type. But are your users ready to refer your app yet? That’s where feedback evaluation comes takes the front seat. The key to business success lies in constantly evaluating the feedback from your existing user base. That’s where specific techniques like NPS come into play. NPS or Net Promoter Score is a standard for understanding the willingness of a user to recommend your app to their network of friends and family. While NPS can be used in various contexts, it is a definite factor to be considered before actually running referral campaigns. We’ve discussed NPS at length in an old post here and encourage that you dive into it before proceeding further. If your results lean towards promoters, it’s time to introduce your users to referrals, but if the data is leaning towards detractors, it’s wise to work towards building loyalty first. Clearly, you wouldn’t want to invest time and money in referrals when your users aren’t satisfied in the first place! Mobile based referrals usually bring in a steady stream of users to your app. But even before you’ve introduced your existent users to a referral campaign one needs to streamline the incentive strategy. Incentive is key to user motivation. The following factors need to be considered before rolling out a referral campaign. Incentive Type– Determine the incentive type that will compliment your app and its users. This can include gift coupons, cash incentives or even non-tangible incentives such as coins in gaming apps. Incentive Value– Incentive value is a critical aspect while considering referrals since they will be released from your marketing budgets. Make incentive value tempting but not at the cost of booking losses in the long run. Style of gratification– Business Managers should factor the gratification style (one way or two way) that they wish to offer. Advanced referral solutions usually tend to offer deep insights into what’s working and what’s not working for your mobile referral campaigns. Such platforms are known to bring in heaps of data to your doorstep. Data mining is, therefore, key to making sense of it all. However what’s important here is to be able to move away from vanity metrics and analyze the right data points. 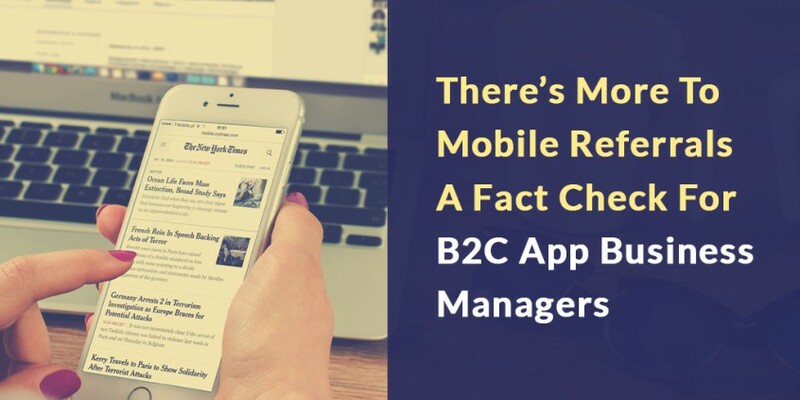 We’ve often seen seasoned Business Managers spending numerous hours in evaluating each and every data point that concerns mobile app marketing but don’t give enough time in pinpointing the ones that make sense for each marketing tactic. Every marketing tactic/hack needs a different treatment. App launch time or active user may be a good number to monitor while evaluating an overall app marketing strategy but not a good number while running referrals. 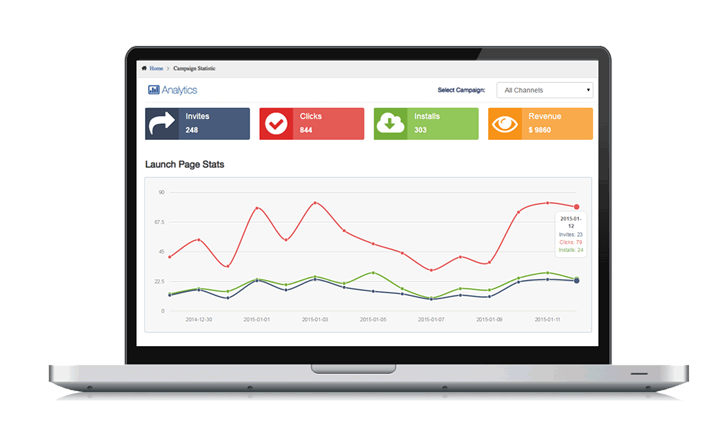 What’s important here is to monitor parameters such as installs, clicks, revenue or CLTV. Identifying the need for mobile referrals is just a start point. What matters the most is to assess the various realms of it and test different pre-marketing strategies before making the final commitment to a service provider. What’s attracting you towards referrals? Are there any significant tests that you’ve run to ensure that this strategy will help you? We would love to speak with your team to understand your requirements and pain points. How To Optimize Mobile Referrals – It’s More Than Adjusting Incentives!